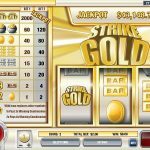 Strike Gold is a 3 reels slot game released in 2008 by Rival. It is a progressive jackpot kind of slot so the more you play the bigger the jackpot becomes. As you suspect the main theme here is gold and it will solve all your problems. The Wild here is the Strike Gold symbol that substitute others to help you create a winning combination. All your wins will come with a 2x multiplier for one wild and a 4x for 2 wilds. It is also the Jackpot symbol and landing 3 of it will win you the progressive jackpot!! Let’s be fair here, the chances of winning the progressive jackpot are not that high. Does it mean you should move along to the next game? not at all. 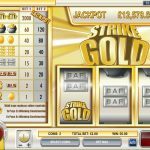 This is still a good classic slot game with good chances of making a good return on your money. So give it a try if you’re a fan of 3 reel slots. 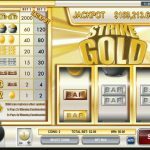 If you’re a fan of classic slot games then maybe you should consider playing One Million Reels BC a 3 reel slot by Rival.